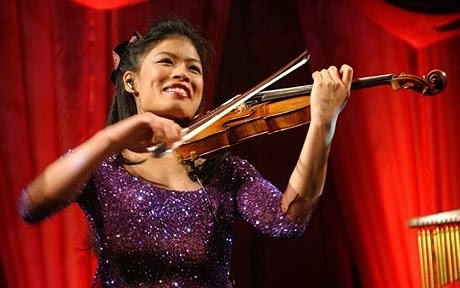 Thai-British violinist Vanessa Mae will ski for Thailand in the Winter Olympics next week. ....Possibly one of the more unusual stories to come from the Games, and they're just starting. Fans of Mae will know she's always loved skiing (no, me neither) and has been building up her points over a number of competitions - she's ranked 3,166 in the world in Giant Slalom. Coming from Ireland where we have a 'Granny Rule' to get British-born players onto the football team, I had to laugh at this line from Mae: "'I'm British but realistically there is no way I could represent my own country, but because my natural father is Thai, they have accepted me." I wouldn't usually draw attention to someone's age, but she's 35. It's great to see Mae striking out and still reaching for new goals at an age when many women are turning to the sofa. The BBC quoted her manager saying: she qualified "by a whisker" by pelting through four events in Slovakia recently. Seems it's all under this quirky Olympic rule: "Under current Olympic qualification rules, countries with no skier ranked in the world's top 500 may send one man and one woman to the Games - to compete in slalom and giant slalom.". And you know, this is why we love the Olympics - you just don't get stories like this at other championships. Eurosport video here from December of a tournament in Val d'Isere - warning though, you will want to try this after watching.